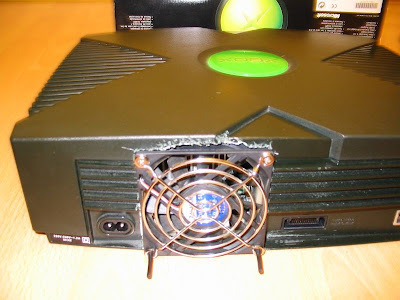 I have modified my Xbox before to replace the 60mm x 60mm x 25 mm stock fan with a 80mm x 80mm x 15mm Everflow fan (following this tutorial), but a while ago the fan started to make a whizzing noise, and since originally I had to cut the corners of the fan to get it in, I wanted to change this time and put the fan on the outside, so I can try with different fans, without having to alter them. 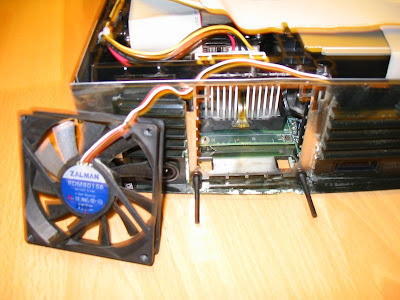 For the external mod the fan will be on the outside of the case, in the same position as the original fan. Most of the cutting is in the base plastic case, but there is some cutting to be done in the cover plastic case to accomodate for the top of the fan. I have also cut the metal grill for beter flow. I've used a side cutter but I'm sure there better tools for a cleaner cut. I have ordered the Sharkoon Silent Eagle "Golf Ball" 80mm fan (SK-SE2000-80) from Performance-Pcs.com - the bad news is that I have received the 1000 RPM version, which proved to be very quiet, but it didn't move enough air (only 11.35 RPM) and it didn't allow to control the speed (update: see footnote). As a nice touch, the package included 4 rubber bolts, and will use those. The nice thing about this mod is that there is no fan altering, so I could use eventually the trusty Zalman ZM-OP1 (80mm x 80mm x 15mm) - for a thin fan it blows a respectable amount of air and is quiet too. 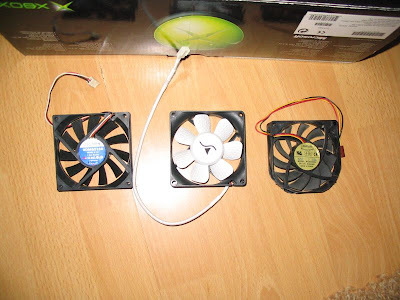 The fans I mentioned above, from left to right: Zalman, Sharkooon, Everflow. Here's the final cut - you can notice at the bottom the two holes I drilled in the metal frame, that's where the Sharkoon rubber bolts will go. 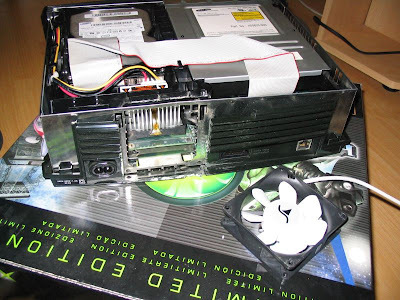 The metal frame was already cut in the factory in such way that there's no way to drill another two holes at the top - but that's not really a problem, the two rubber bolts should be enough, and when the case is closed the plastic top cover will press the fan in place. Additionally we'll use a silicone fan gasket between the metal frame and the fan, to eliminate any vibrations. Fan wired in, the rubber bolts, ready to fit the fan. The finished product (I know the cut in top cover is a bit ugly...). For a nice finish I've used a fan grill, held in place with just two screws, but it should be ok.
You are a butcher dude!